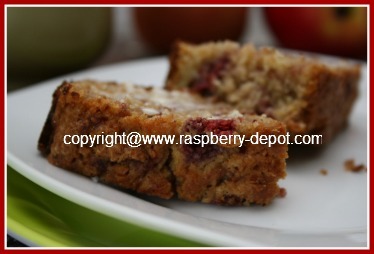 This Raspberry Apple Bread Recipe, (see the pictures!) makes a delicous, fabulous(!) 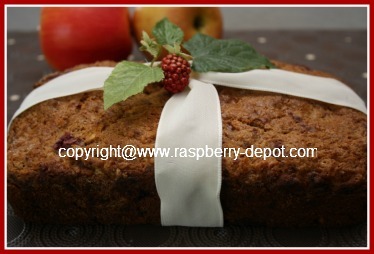 homemade, moist fruit bread that is lactose and nut free! 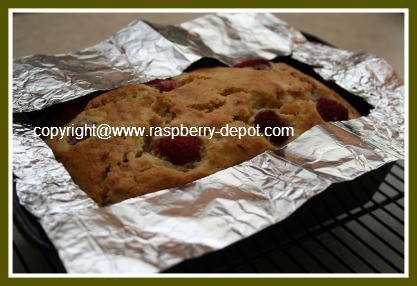 I made this recipe for a raspberry loaf today, using the last of my whole frozen raspberries in the freezer. I simply ♥ LOVE homemade breads from scratch that include berries! One bite of this bread, and you realize it tastes like "more"! In a large bowl, whisk together the flour, baking powder and the cinnamon to combine. Whisk in the granulated sugar and the brown sugar. In a small bowl, combine the eggs, oil and the vanilla. Gently so as not to break up the raspberries too much, fold in the raspberries, and stir just until combined. Do not overmix. Transfer the bread batter to a greased (I used non-stick cooking spray), 5" x 8" loaf pan. Note - If the edges of the bread start to become too dark, make a simple shield using foil paper - see baking tip below. 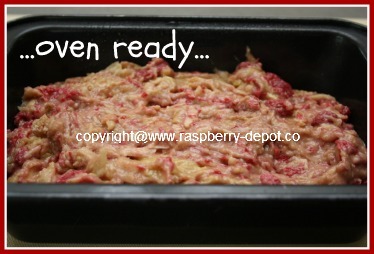 Allow the raspberry apple bread to cool for about 10 minutes, and then remove to a wire rack. 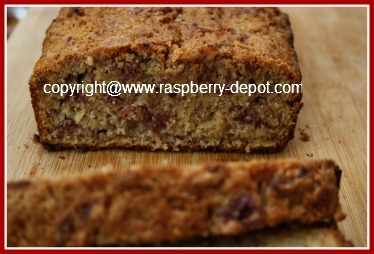 Slice to serve, and spread with butter or raspberry jam. I'm not sure about you, but I often find that, when baking a loaf of quick bread in a loaf pan, the edges get too dark. In order for the center of the bread to be fully baked, the bread needs to be kept in the oven longer, but I often notice that the edges are becoming too dark and over-cooked. To overcome this problem, I make a protective shield from aluminum foil, much like the handy pie crust shield, that I place over the bread after it has baked in the oven for about half of the total time required, (see the photo below). I have found this to work very well in preventing the edges of the bread from becoming too dark, and the home made shield can usually be kept for the next time you make a loaf.